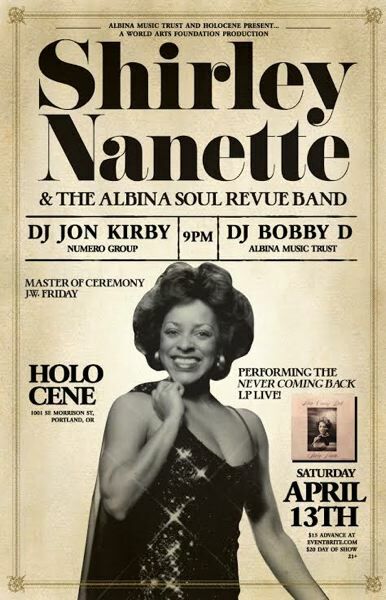 Reminder: Shirley Nanette & The Albina Soul Revue Band perform Nanette's 1973 LP "Never Coming Back," 9 p.m. Saturday, April 13 at Holocene, 1001 S.E. Morrison St. It's the first time Nanette will perform "Never Coming Back" in its entirety live. Tickets: $15, $20 at door, holocene.org. It's a World Arts Foundation production. Deejays Jon Kirby of Numero Group and Bobby D of Albina Music Trust support. Oregon Public Broadcasting's new documentary, airing April 22, explores the history of the state's Japanese community, from pioneer days up until their forced incarceration during World War II and their fight for reparations decades later. The "Oregon Experience" documentary shows on OPB at 9 p.m. Monday, April 22, and will be available online at the same time at opb.org/JapaneseAmericans. The Science on Tap program has an interesting new show at Alberta Rose Theatre, 3000 N.E. Alberta St. It's "Science is Stranger Than Fiction: Death and the Afterlife, 7 p.m. Tuesday, April 16. Leslie New, assistant professor of statistics at Washington State University Vancouver, will lead the discussion and show visitors weird specimens from museum collections in the western world and describe how scientists throughout the centuries have tried to understand death and the afterlife. Tickets: $15, $8 student, www.albertarosetheatre.com. Here's a movie event to consider: The Banff Mountain Film Festival World Tour, 7 p.m. Thursday-Saturday, April 11-13, at Revolution Hall, 1300 S.E. Stark St. For more: www.revolutionhall.com. Nonprofit Wind & Oar Boat School will provide boat-building summer camps for ages 9-15 at its shop, 2303 N. Randolph Ave. There'll be three one-week camps, July 8-26 — 9 a.m.-12:30 p.m., 12:30 p.m.-4 p.m. or all day. It's $350 a week for morning or afternoon sessions, and $700 for the whole week. The Friends of Multnomah County Library are putting on the Spring Used Book Sale, April 26-29, at DoubleTree by Hilton Hotel Portland, 1000 N.E. Multnomah St. It'll feature more than 40,000 items at affordable prices — trade paperbacks starting at $2, mass market paperbacks and children's books at 50 cents and $1, CDs at $1 and DVDs at $2. It's free to attend. For more: www.friends-library.org. PHAME Academy is collaborating with Portland Opera for a big event in August. It's been 18 months in the making between the academy, which empowers adults with developmental disabilities to lead creative lives through arts education and performance, and Portland Opera, one of the city's preeminent arts organizations. The production will feature artists and performers with disabilities at every step of the process — writing, composing, designing costumes, acting, singing, etc. Dance duo Wobbly Dance will serve as the production's choreographers, and the show will be accompanied by an orchestra made of iPads, played by PHAME students, and joined by a Metropolitan Youth Symphony string quartet. The Northwest Food Show, this weekend at the Expo Center, is a business-centric event that will welcome celebrity chef Marcus Samuelsson as a special guest. He's an Ethiopian/Swedish chef who presides at the Red Rooster in Harlem, New York. There'll also be personalities from the TV show "Bar Rescue" conducting a panel discussion. For more about the show, see www.NWFoodShow.com. Attendance is generally restaurant owners, chefs and cooks, lounge owners and specialty store owners.